How to Request to Participate: You must either be an existing member of the ATCitupwithfriends community or have received an invite from Pabkins. Currently the monthly trade group is full and is for the time being by invitation only. However I do try to add new artists to the group from the wait list each month. So don’t be discouraged if you are new and hope to participate for the first time still fill out the form at the bottom to be placed on the wait list. Those invited please fill out the form as well. You will get a confirmation email within a few days. We have a monthly participation roster of about 100 artists each month so I appreciate your understanding. email ATCitupwithfriends@gmail with questions. ATCitupwithfriends now has an ongoing Art book series! The info on how to be included is in the signup form at the bottom of this post. There is also a fun monthly newsletter, signup is in the form. See Pabkins open envelopes each week on Tuesdays @ 1030AM PST on my TWITCH CHANNEL! That’s right back by popular demand – Robots! If you participated last year and have scans of your robot cards email them into ATCitupwithfriends@gmail.com so we can start compiling this one into a super fun artbook as well! There have been quite a few folks that have requested the robot theme return this year because they loved it last year or they missed it. It has definitely been the most highly requested so I hope you are as excited as I am! On a special note: If you happen to make any of your Robot cards during the month of March be sure to post them to instagram and when you add your #ATCitupwithfriends tag don’t forget to tag them #marchofrobots and #marchofrobots2019 as well because each year in March there is a challenge hosted by @chocolatesoop where 4 people can win a wacom graphics tablet and clip studio paint software. Maybe someone from our fabulous community can win one! REQUIREMENT: Your cards MUST feature a robot obviously! Remember cards CANNOT be fan art. Do you need some inspiration? I’ve got you covered just see some ideas below and of course a fabulous pinterest board! – Does your robot have a job? lets see them at work! – Is your robot made up of unusual scrap parts? – Perhaps it’s a long forgotten ancient robot among fallen ruins? – There are endless things you can do with this theme as we saw in the first Robots Trade last year. So have fun with it! PLEASE FOLLOW THE ADVISED SHIPPING TIME! If your cards don’t arrive by the due date I DO NOT guarantee they will make it into the swap group. – SENDING EARLY IS FINE! SENDING LATE IS NOT! It is upon my discretion to return late cards back to the artist’s unswapped. If you are a constantly late mailer I will start returning your cards unswapped. Please extend me some respect by mailing in a timely manner! I DO check postmark dates, so if your cards arrive outside my grace window and I notice you mailed them the last day of the month or after, it is upon my discretion to send them back to you unswapped. These events happen every month so sending late really affects the schedule. – CREATE 3 ORIGINAL Hand drawn or hand painted artist trading cards from the above theme. No Political, Religious, or sexually explicit cards permitted. Or I will need to return them unswapped. Originality and diversity is welcome, DO NOT COPY or TRACE OTHER PEOPLE’S ART, or artwork you find on the internet. This should be YOUR original art. – SIZE MATTERS! Cards absolutely must be the standard size of 2.5 x 3.5 inches NO LARGER! NO SMALLER! with straight cut edges/sides or your cards will be returned unswapped. (vertical or horizontal format is fine) I CANNOT STRESS THIS ENOUGH!! – Optional 4th card: – “Host Gift Card” for Pabkins! It’s just an extra 4th card in the same theme if you have time. Everyone that knows me knows I’m a CRAZY art card addict. Running this group takes a lot of my time and effort and I constantly make extra cards for the group, thus I don’t do many personal trades anymore since most of my cards go towards the group events and sales to support group maintenance costs. So if you want to put a big smile on my ATC loving face send 4 cards instead of 3 and I’ll get to choose and keep one – Yippeee! I literally do a happy dance when I get one! Folks that do often get the extra bonus cards when they are available. I try to keep extra originals on hand as bonuses and for emergencies. – All Cards must be RECEIVED by Pabkins on or before the DUE DATE! I give a 10 day grace period if you’ve mailed out in a timely manner and notified me asap as that is about the time I start laying out the cards for swapping. If you aren’t postmarked by the last day of the month and haven’t notified me I will not accept your cards. If you are mailing late I recommend you send priority. It is up to my discretion to turn away artists that are constantly late in sending their cards, or if they rushed the quality. It isn’t fair to swap your 1 hour rushed cards for ones others spent a fair amount of time on. Please don’t make me the bad guy, I have to set down guidelines to keep things fair and this community running smoothly. – You only receive cards if you send cards. Please share a photo of your completed cards to the #ATCitupwithfriends hashtag when you are done. That way I can see that you made them and so folks can express their like/love/interest and interact with the community! Please share your returns when you receive them. This is a community and folks like to know where their art ends up. You can share your WIPs as well but if you want to get really interactive with the group I suggest you join our discord chat server and post wips in our wip chat channel. – ORIGINALS only! No prints! Do not copy someone else’s art, no copying images you found on the internet, no tracings, If you reference something don’t reference something else to death such that it isn’t your own! Absolutely NO stamps, NO linocuts. Create your own original work of art! Fan Art is no longer swapped in this group, so no fan art please! Hand drawn or painted cards only! Don’t make 3 practically identical cards, with “different window dressing” that does not show creativity or effort! DO NOT send the exact same face shot and composition cards every month, break outside the box and try something new. New compositions, new poses, etc. If you question the quality or content of your own card and know in your heart that you wouldn’t be happy to receive it please consider that before sending it in! Why not try again if you “aren’t the happiest how it turned out”? feel free to message me for feedback or seek feedback on our discord chat server. Originality and “thinking outside the box” is encouraged! We all love artistic creativity, but IF your interpretation makes the theme unrecognizable, or makes it such that the THEME is not THE THEME any longer – then it is not meeting the theme requirement and not fair to be swapped. 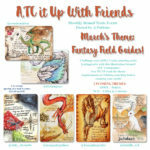 #ATCitupwithfriends is intended as a challenge community as well as an awesome trade, but when signing up for a theme – you are saying you will create in that theme! No collage, NO stamps, no embellishments, NO stickers. Nothing that pops up from the surface. What does that mean! ?No glued together bits and bobs this is NOT crafting, scrapbooking, mixed paper media. Papercut accents is fine as long as it’s your original work. This is NOT a scrapbooking style art trade group! Fan Art is no longer accepted in these trade events. Our focus is to challenge your own creativity. NO GLUE ON! NO STICKERS! – A good rule of thumb is – if you had to glue it on, or if its a STICKER then it is not allowed in this group. The ONLY exception is hand drawn/handcut cut papercut accents. This is upon my discretion. Please just ask if you have questions. The only reason I add all of this is because there are other “mixed media collage” type trading groups around the internet, this is not one of them. Do NOT leave flat white backgrounds This also means if you used toned/color papers you still have to give the entire card attention, this is not a rough quick piece of art nor is it a line art only card, it should be a fully finished piece of art and you should be touching the entire surface of the card. I WILL send it back unswapped. Solid one color filled in backgrounds are also discouraged. Come on folks Please put in some actual effort and try for a background or “atmosphere” on your card! – INDIVIDUALLY sleeve each card – document protectors, penny sleeves PREFERRED (see this link), or ziplock bag – just protect it as envelopes often get wet! If you don’t have sleeves I will sleeve them when they arrive but still put them in protection of some kind. I will expect you will acquire sleeves for the next time you join. LOST MAIL, LOST CARDS – I am not responsible for lost or stolen mail. If I do not receive your cards I cannot swap out cards from the group swap. I try to make sure no one goes with an empty mailbox but I cannot do this alone as the group is too large. At least 2-4 envelops a month go missing. Donation cards for lost or stolen envelopes are appreciated. If I attempt to replace a lost envelope it will be solely upon my discretion and likely only if you are an outstanding member of the group. I have a sneaking suspicion I have been duped several times over the past 2 years. – NO need to send envelopes I provide those! Just DEFINITELY SEND A STICKY LABEL WITH YOUR RETURN ADDRESS WRITTEN or PRINTED NEATLY ON IT! – INTERNATIONAL ARTISTS: – Please send $2 via paypal using this Donate button When You Mail Your Cards please. If you plan to play each month you can paypal once for the whole year, or you can use my Ko-fi or the below paypal to set up an automatic payment each month.